Our second wedding cake on Saturday 10th June was for Jane and Amir, who were married at the lovely Rayleigh Windmill, Rayleigh, Essex. They then celebrated their wedding at their home in Leigh on Sea, where we delivered the cake, which was a first for us here at Sticky Fingers Cake Co. It was really lovely setting up their 4 tier naked wedding cake with just Jane and her daughter there (the calm before the storm!) and even better getting lovely feedback straight away – Jane was blown away by the cake, which is what it’s all about. Furthermore, when Jane dropped our tree slice cake stand back the following day, she said the cakes tasted amazing too – yay! 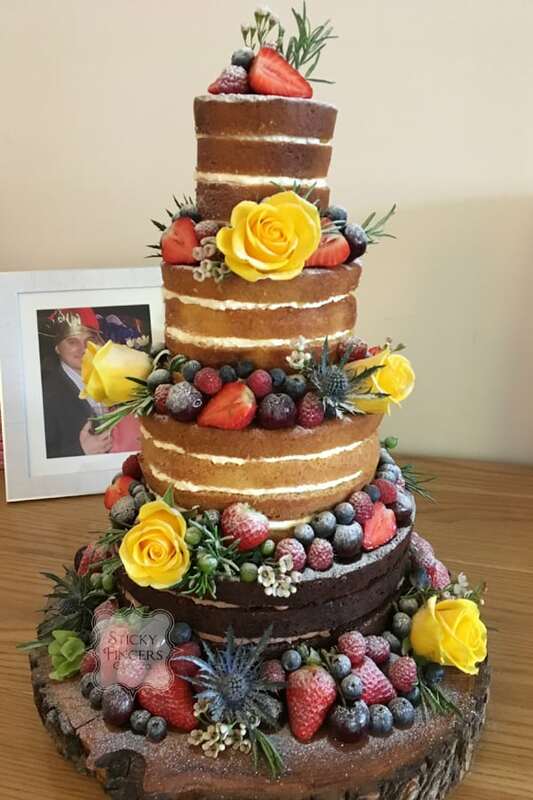 Their cake was made up of Rich Dark Chocolate, Cherry Bakewell, Zesty Orange and, finally, White Chocolate and Passion fruit tiers and decorated with fresh, seasonal berries, a few flowers supplied by their florist and a dusting of icing sugar. So happy you had such a lovely day and sending you huge congratulations too!